Plastic products are long lasting and used in so many products. Even tiding or making net plastic sutli or string is used more than other materials. The main benefit of plastic string is that it lasts long and having more strength. Even plastic is cheap an easy available source and can be recycled. We are manufacturing and supplying this Sutli Plant or string plant. Our machines are capable of giving 100% output. We are manufacturing various models as per the client production output require. We can also able to provide T-die and blown film type string/ sutli plant which are suitable for PP synthetic jute. Auto chhese winder is provided in different width of coil as per the requirements of coil width of 40 mm, 50 mm, 60 mm, 100 mm, 150 mm, and 200 mm. Options are valuable in screw dia of 40 mm, 50 mm, 65 mm, 75 mm, and widely used for loose packaging, teeing of bags and twisted rope making. With Synthetic string plant bulk production of plastic string can be done. Plastic string is applied for exterior loose packaging. Sutli machine or synthetic string machine is a reliable choice of machine that can produce twisted plastic strings and synthetic string lines which are then applied in the place of conventional jute strings. With Synthetic string plant bulk production of plastic string can be done. Plastic string is applied for exterior loose packaging. Sutli machine or synthetic string machine is a reliable choice of machine that can produce twisted plastic strings and synthetic string lines which are then applied in the place of conventional jute strings. Synthetic string lines produced from sutli plant are much stronger than other conventional materials. This equipment is a cost effective option for making large quantity of strings and line materials. With String Sutli Plant bulk production of plastic string can be done. Plastic string is applied for exterior loose packaging. Sutli machine or synthetic string machine is a reliable choice of machine that can produce twisted plastic strings and synthetic string lines which are then applied in the place of conventional jute strings. Synthetic string lines produced from sutli plant are much stronger than other conventional materials. This equipment is a cost effective option for making large quantity of strings and line materials. With Synthetic String Sutli Making Machine bulk production of plastic string can be done. Plastic string is applied for exterior loose packaging. Sutli machine or synthetic string machine is a reliable choice of machine that can produce twisted plastic strings and synthetic string lines which are then applied in the place of conventional jute strings. Synthetic string lines produced from sutli plant are much stronger than other conventional materials. This equipment is a cost effective option for making large quantity of strings and line materials. With Synthetic String Sutli Plant bulk production of plastic string can be done. Plastic string is applied for exterior loose packaging. Sutli machine or synthetic string machine is a reliable choice of machine that can produce twisted plastic strings and synthetic string lines which are then applied in the place of conventional jute strings. Synthetic string lines produced from sutli plant are much stronger than other conventional materials. This equipment is a cost effective option for making large quantity of strings and line materials. Optimum product costing due to high productivity with less power consumption. Nitrides screw and barrel made out from special nitro alloy steel for long life and trouble free operations. Manual lever type screen changer. Uniquely designed 'T' die ensuring uniform flow distribution. Cheese winders with different size winding options like 2.5", 4", 6", 8" etc. Synchronization of all AC motors. With Synthetic String Sutli Line bulk production of plastic string can be done. Plastic string is applied for exterior loose packaging. Sutli machine or synthetic string machine is a reliable choice of machine that can produce twisted plastic strings and synthetic string lines which are then applied in the place of conventional jute strings. Synthetic string lines produced from sutli plant are much stronger than other conventional materials. This equipment is a cost effective option for making large quantity of strings and line materials. With Synthetic String Sutli Plant in India bulk production of plastic string can be done. Plastic string is applied for exterior loose packaging. Sutli machine or synthetic string machine is a reliable choice of machine that can produce twisted plastic strings and synthetic string lines which are then applied in the place of conventional jute strings. Synthetic string lines produced from sutli plant are much stronger than other conventional materials. This equipment is a cost effective option for making large quantity of strings and line materials. With Synthetic String Sutli Plant Manufacturer bulk production of plastic string can be done. Plastic string is applied for exterior loose packaging. Sutli machine or synthetic string machine is a reliable choice of machine that can produce twisted plastic strings and synthetic string lines which are then applied in the place of conventional jute strings. Synthetic string lines produced from sutli plant are much stronger than other conventional materials. This equipment is a cost effective option for making large quantity of strings and line materials. With Plastic Twin Making Machine bulk production of plastic string can be done. Plastic string is applied for exterior loose packaging. Sutli machine or synthetic string machine is a reliable choice of machine that can produce twisted plastic strings and synthetic string lines which are then applied in the place of conventional jute strings. Synthetic string lines produced from sutli plant are much stronger than other conventional materials. 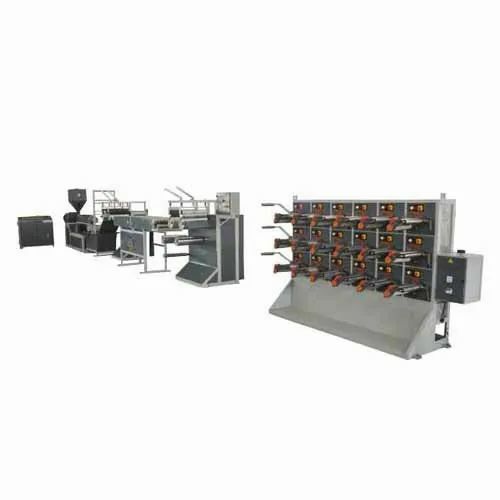 This equipment is a cost effective option for making large quantity of strings and line materials. With Jute Sutli Making Machine bulk production of plastic string can be done. Plastic string is applied for exterior loose packaging. Sutli machine or synthetic string machine is a reliable choice of machine that can produce twisted plastic strings and synthetic string lines which are then applied in the place of conventional jute strings. Synthetic string lines produced from sutli plant are much stronger than other conventional materials. This equipment is a cost effective option for making large quantity of strings and line materials. With Plastic Twin Making Plant bulk production of plastic string can be done. Plastic string is applied for exterior loose packaging. Sutli machine or synthetic string machine is a reliable choice of machine that can produce twisted plastic strings and synthetic string lines which are then applied in the place of conventional jute strings. Synthetic string lines produced from sutli plant are much stronger than other conventional materials. This equipment is a cost effective option for making large quantity of strings and line materials. With Plastic Sutli Making Machine bulk production of plastic string can be done. Plastic string is applied for exterior loose packaging. Sutli machine or synthetic string machine is a reliable choice of machine that can produce twisted plastic strings and synthetic string lines which are then applied in the place of conventional jute strings. With Plastic Sutli Line bulk production of plastic string can be done. Plastic string is applied for exterior loose packaging. Sutli machine or synthetic string machine is a reliable choice of machine that can produce twisted plastic strings and synthetic string lines which are then applied in the place of conventional jute strings. Synthetic string lines produced from sutli plant are much stronger than other conventional materials. 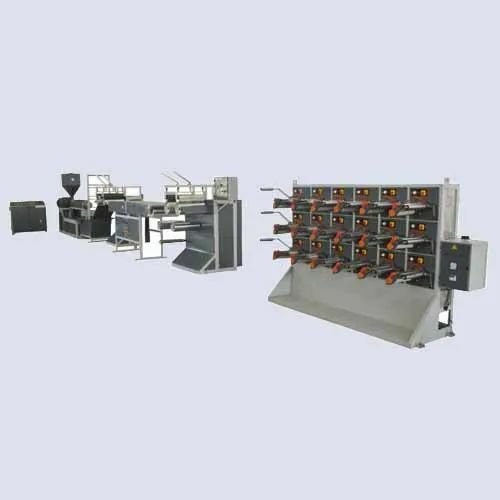 This equipment is a cost effective option for making large quantity of strings and line materials. Looking for “Synthetic String Sutli Making Machine”?